Black + Decker EM720CPN-PMB is a black and stainless steel microwave oven with a 700 watt capacity and a 10-inch diameter glass turntable. In the box, you’ll find a microwave oven and a user manual as well as a limited warranty of one year by Black and Decker. You have four other options on the same page: EM720CB7 model 0.7 cu. ft. 700W stainless steel, EM925AB9 model 0.9 cubic feet 900W stainless steel, EM031MB11 model 1.1 cubic feet 1000 watt stainless steel and EM036AB14 model 1.4 cubic feet 1000-watt stainless steel microwave ovens. They have an average rating of 3.9 out of 5 stars by 19 customers on the day of this product review. They all have similar features and slight differences along with the power and size capacities. 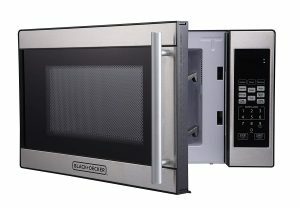 We’ll focus on the first 700-watt power microwave and check out its features. Firstly, it comes with a clock and kitchen timer, child security lock, interior light as well as 10 power settings of up to 700 watts. On the large LED-backlit digital display panel you’ll find the pre-set buttons for fresh veggies, frozen veggies, pizza, soup, potato, popcorn, dinner plate and beverage. You can cook or reheat these eight items with a single touch of a button. You can choose the heat and defrost options to heat up left over meals or thaw the frozen items- veggies, fruits, meats etc. quickly without overcooking. Stainless steel Black + Decker EM720CPN-PMB weighs 23 pounds with the measurements of 17.3 x 13.97 x 10.17 inches and has a 0.7 cubic feet capacity. It has a sleek and modern design with a classic stainless steel exterior and will look good in any kitchen. The 10” size glass turntable rotates when you turn on the microwave, so your meal can be cooked evenly with the hotspots prevented. The large 10” dinner plates will fit nicely on this turntable. You can remove it easily and wash the turntable and wipe the interior with a damp cloth. There is a large round door handle that lets you open and shut the microwave door easily. With the Express Cook you can turn it on for 1 to 6 mins at 100% power by just pressing a number. And it can be stopped by just pressing the Stop button. You can do pretty much everything you do in the larger microwaves with more power but it will only take a bit longer on this one. You’ll hear a loud beep sound when the time is up- when the cooking is completed and there is no way of turning it off. The interior of the microwave is white enameled metal and there won’t be any rusting over time. The vent is located on the left of this countertop microwave oven and you shouldn’t use it as a built-in unit with less than three inches of clearance. 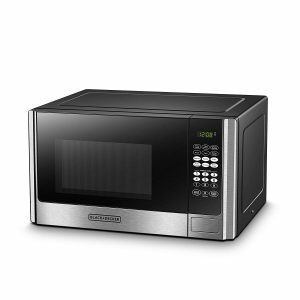 You can use this compact microwave a few times a day without problems and it does the job well, runs quietly except for the loud beep and is offered at a very reasonable price. Any of the negative reviews you see online are because the small percentage of the defective products were sent to these customers or they do not know how to operate the microwave as they haven’t read through the instructions manual. Overall it is good value for money, whichever of the four models you choose. *Black + Decker is a leading tools and storage company with a history of more than a century, that was founded in Baltimore, Maryland in 1910. They have a variety of products in power tools, batteries and accessories, lawn and garden, pets, home cleaning, battery systems, small home appliances and more with a focus on innovation and customer satisfaction.